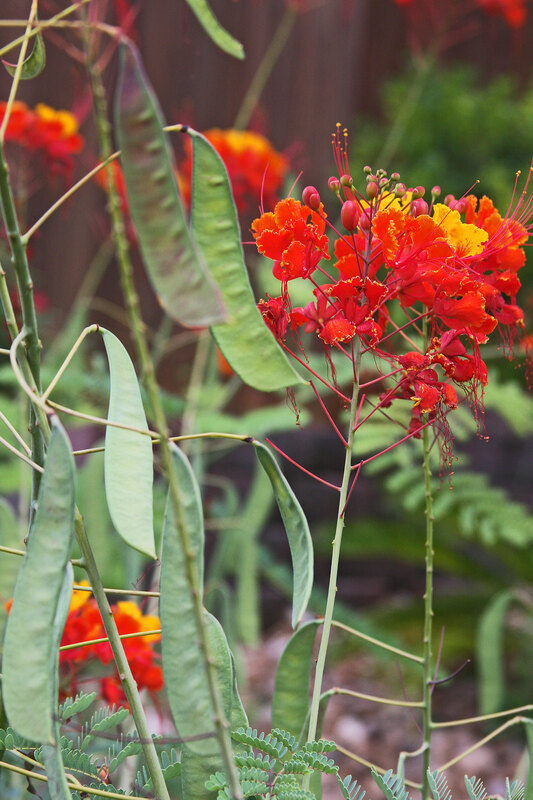 Blooms may last longer in cooler climates but cooler climates do not have the potential for two spectacular bloom periods each year as South Texas does. Most of us expect our flowering perennials to bloom well in the spring but overlook the best possible season for bloom - - fall. Remember, plants are not flowering to make us happy; they are flowering to produce seed and complete the reproductive stage of their life cycle. 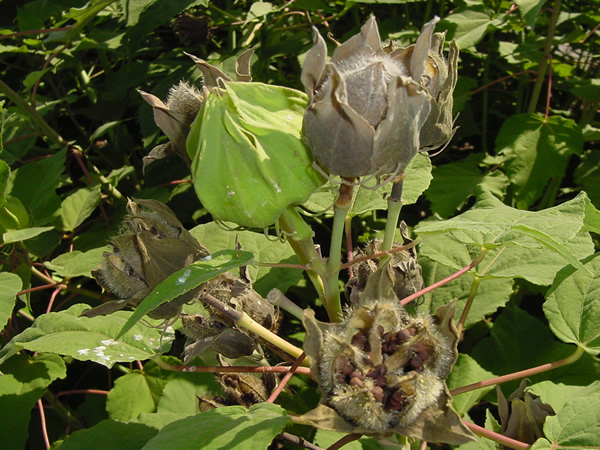 If the old flower stalks are cut off and not allowed to mature seeds, the plant will attempt to make more seed. Then we get to enjoy another bloom cycle. 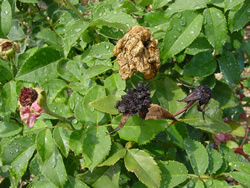 Crapemyrtle seed pods have been removed. Hot weather greatly shortens the life and beauty of blooms. During the spring bloom season, Texas weather is making the transition from winter to summer. Unfortunately the transition period may only be for several days, i.e., Texas temperatures rapidly change from frosty to scorchy. 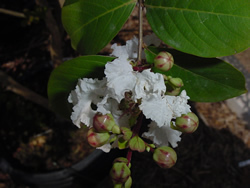 The fall weather conditions, in comparison, are ideal for blooms. Usually extremely hot weather ends in September and the cooler temperatures, especially at night, signal that the South Central Texas second "spring" has begun. These cooler temperatures stimulate plant growth and intensify the color and duration of the blooms. Many people do not prepare their plants for this second spring so they miss really the most spectacular bloom period. 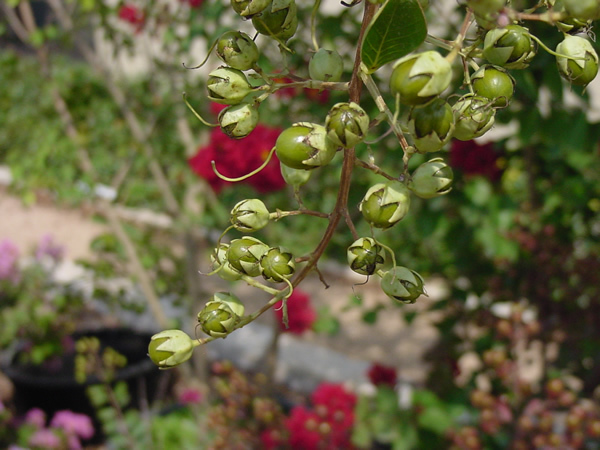 Once plants have flowered and produced seed the plants puts all of its energy into maturing the seed and does not bloom again. Flower petals burn in the summer sun. August is the time to act. 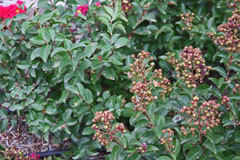 Remember, shrubs that bloom after June usually do so from buds that are formed on shoots that grow the same year. 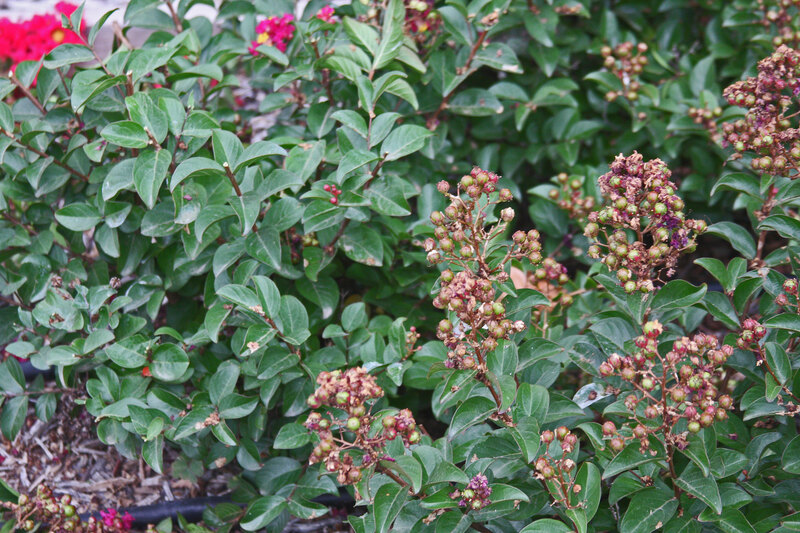 These shrubs should be pruned in late winter to promote vigorous shoot-growth in spring. 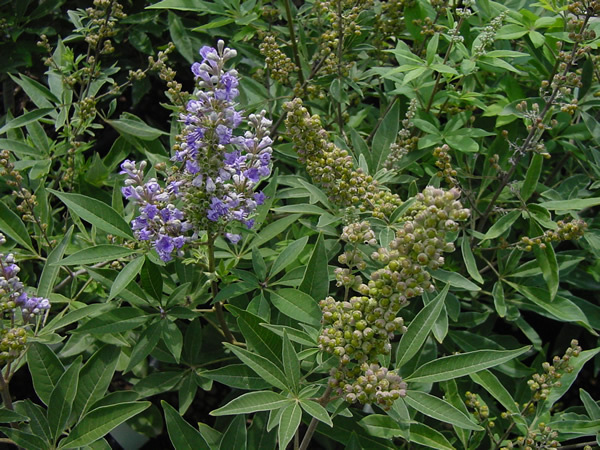 Examples of shrubs that bloom on current season's growth include: Vitex, Buddleia David or B. globosa (buddleia or butterfly bush), Hibiscus syriacus (shrub althea), Hypericum spp. (St. Johnswort), Lagerstroemia indica (crapemyrtle), and Rosa spp. (roses). 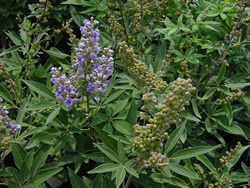 There are many examples of flowering perennials which should be cutback to encourage reblooming. 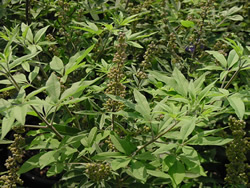 Fall-blooming perennials, such as Salvia greggii and S. farinancea, Mexican marigold mint (Tegetes lucida), chrysanthemums, and Salvia leucantha, should have been pruned periodically during the summer to keep them compact--if you didn't do that pruning, cut them back by one-third as soon as possible. Perennial or Summer Phlox (Phlox paniculata) such as 'John Fanick' or 'Victoria' should be cut to the ground and allowed to resprout with new stems. To stimulate rapid re-blooming and more and larger flowers, one pound (1 cup) of a slow-release formulation of lawn fertilizer (19-5-9) should be scattered around each large plant or in a 100 square foot planting area after pruning. CRAPEMYRTLES: Remove as many seed pods as possible from the crapemyrtles by cutting off the entire stalks on which the pods are borne. This gets dozens of seed pods at a time rather than trying to remove them pod-by-pod. 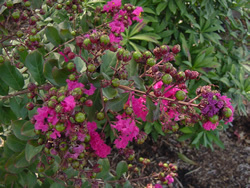 Remove as many seed pods as possible from crapemyrtles by cutting the entire stalk of seed balls. 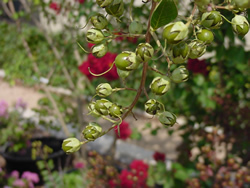 Flower buds can be distinguished from seed balls since seed balls are hard and flower buds are soft. 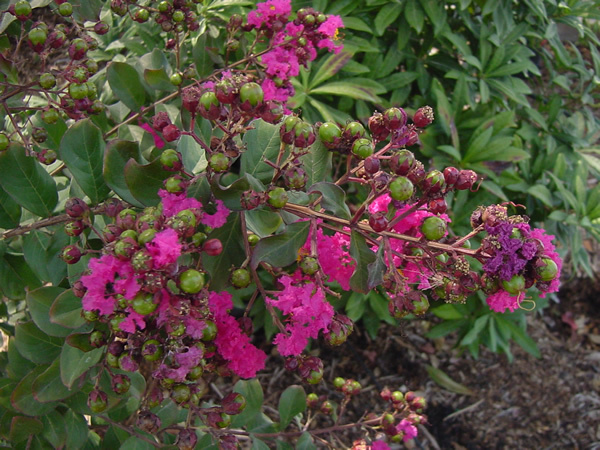 Once 60 percent of the crapemyrtle flowers have produced seed pods the entire flower stalk should be removed. Once the seed stalks have been removed new sprouts will form and additional flowers will be formed at the terminals of the new growth. New sprouts will be produced if seed stalks are not removed--however there will be fewer of them than if all seed stalks were removed. I have cut large plants of 'Gold Star' esperanza to the ground in August and had them blooming profusely as a multi-trunked perennial in October. The hotter the temperature when it is growing back, the faster it grows. Remember, after the cutback and/or seed pod removal, water and fertilize. HIBISCUS SYRIACUS (shrub althea): This is a plant that is seldom cut back for fall bloom. Yet it stops blooming after it sets the seed in the summer-just as crapemyrtles do. 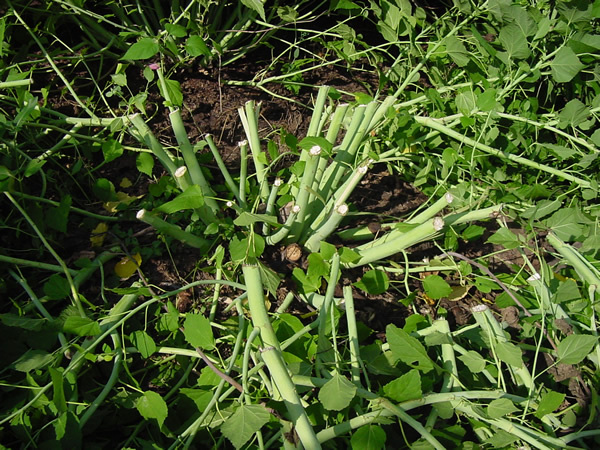 Try doing some summer cutback by thinning out some of the old woody stems and removing all of the seed pods. Don't forget to fertilize and water. Leave an abundance of light-brown, pencil size wood. All seed pods and older wood with no buds should be removed from Shrub Althea. Altheas form buds and bloom on new growth in the spring -- thus flowers open below maturing buds. HIBISCUS ROSA-SINENSIS (Chinese Hibiscus which is tropical and must be given cold protection) also blooms on new growth so rather than having to severely cut the plants back in early winter when the cold weather arrives, why not cut them back in August so they will be manageable when protection time arrives? Also, when you do have to move them to cover, you will be protecting blooms and buds which can provide beauty well into December in this area. 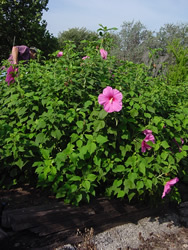 Remember, when you prune the plants back, fertilize regularly with a water soluble fertilizer such as Miracle Grow, 20-20-20 or Hibiscus Food. HIBISCUS MOSCHEUTOS (Perennial hibiscus such as 'Moy Grande', 'Flare', 'Red River' which is cut to the ground every winter and is root hardy all the way to Canada) The concept of severely pruning this plant after the summer bloom and seed set was first shown to me by Ying Doon Moy, retired research and development horticulturist at the San Antonio Botanical Garden. With the exception of 'Flare' hibiscus, most perennial hibiscus put on a wonderful floral display in the spring but are then covered with seed pods the rest of the year until the late fall cutback. Mr. Moy showed me how to induce fall bloom by simply cutting plants back and removing the seed pods. This stimulates new shoots from the remaining stems and an abundant bloom in October when the blooms stay radiant all day rather than being burnt by the hot summer's afternoon sun. I cut my plants flat to the ground and force new shoots from the ground-to Mr. Moy's horror-but I have done this for several years now and have not lost a plant. Mr. Moy selectively thins his plants and leaves them about 20 - 24 inches high but I guess I do not have his patience. 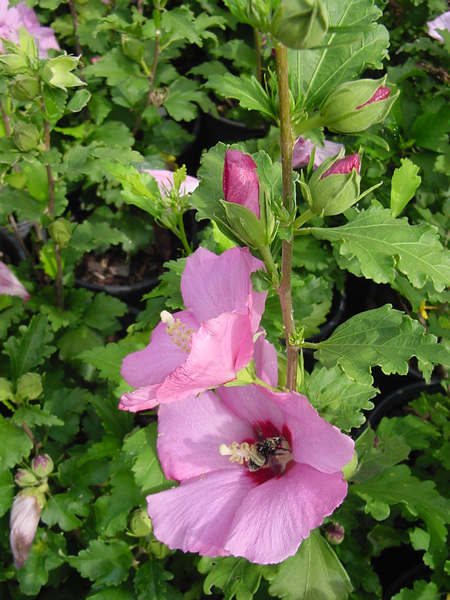 Try the "cut it to the ground" on several of your well-establish perennial hibiscus and see if it doesn't work well for you. This is especially important if you have a seed-producing hibiscus such as 'Moy Grande' or 'Red River'. This late summer cutback also helps with size control and the amount of cutback you will have to do this winter. Remember, after the cutback, water and fertilize. By August perennial hibiscus can become too tall and have diminished bloom. Cut these overgrown hibiscus back to two foot stalks. 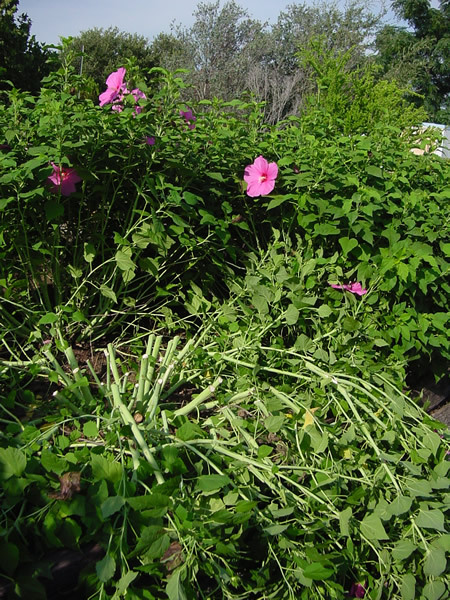 Drastic cutback in August does not damage a well-established perennial hibiscus. If you are worried about this drastic cutback leave a comparison plant of the same variety which you do not cut back. 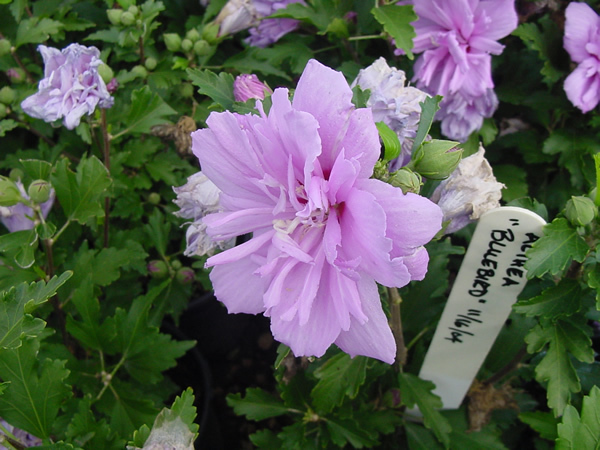 The cutback of perennial hibiscus is especially important for those seedy varieties such as Moy Grande and Red River. ROSA spp. (ROSES) Roses should be pruned or groomed during the first two weeks in September, no later than September 20. Fall pruning is lighter than in the spring. Cut about one-fourth to one-third of the bush. When pruning miniatures, other than cleaning them out, simply cut off all the blooms. When pruning standard size roses remove all the blooms and bloom pods. When removing the recommended one-fourth of the bush cut all canes back to pencil-size wood if the variety permits, remove any crossing canes which might rub and damage adjoining canes and remove any dead or diseased wood. The general shape of a rose bush should be open-centered or vase-like with canes evenly distributed around the outside. To prolong the bloom period you may want to prune only one-half of your rose bush at a time then wait a week to complete the process. The half which was pruned first will bloom first about 45 days after pruning occurred. Remember to complete all fall pruning no later than September 20. Mid-October should begin the peak rose bloom season. Remove and dispose of all diseased leaves with black spots on the foliage. 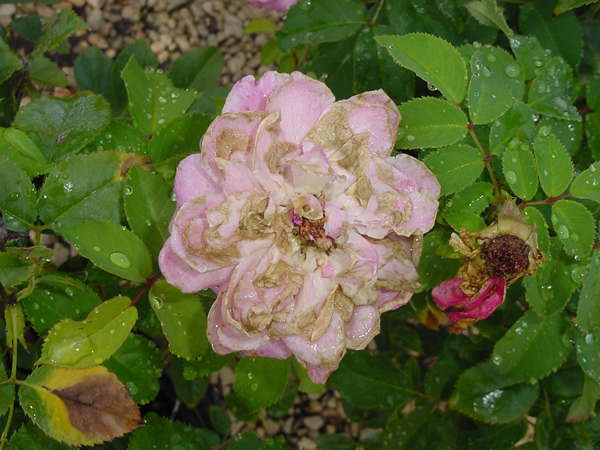 Black spot and powdery mildew fungus must be prevented rather than cured. Prevention is easily accomplished by using Funginex Fungicide (black Spot and powdery mildew are fungus diseases) on a 7-l0 day spray schedule. Orthene insecticide may be added for control of thrips (these cause blooms to stay closed or be mis-shaped). By September, the spray interval should be shortened to every 7 days since disease is more prevalent. Spraying should continue until the first hard freeze occurs. When pruning roses remove all spent blooms and all bloom pods. Once you begin to produce these beautiful fall roses it is important that they be cut properly to insure bloom longevity. 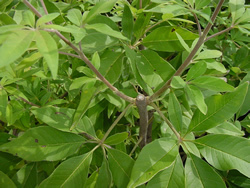 When cutting is done, use sharp tools and allow at least two leaves to remain between the cut and the main stem. Use sharp shears just above the topmost leaf. Roses that are cut just before the petals begin to unfold will open normally and remain in good condition longer. Late afternoon is the best time of day to cut roses. 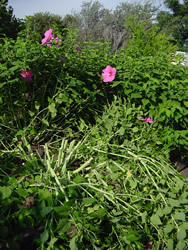 Always cut bloom stems back to pencil-sized wood or where five-leaflet leaves occur. 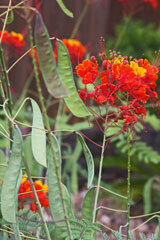 Beginning in mid-November, leave old blooms and pods on stems to force plants into dormancy. 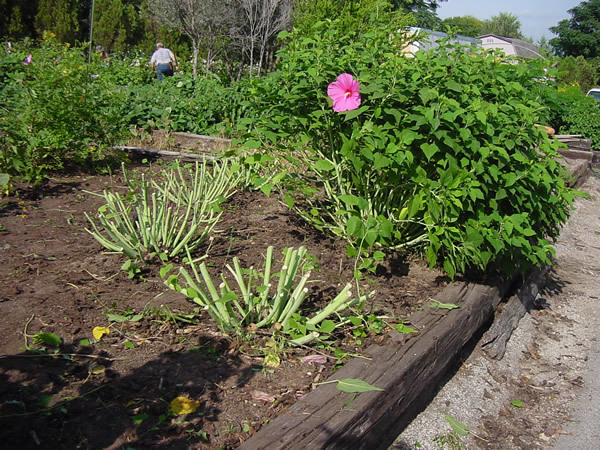 This winterizing will enable better plant survival in the winter. 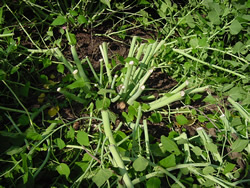 Plunge the stems immediately into warm water (about 100 degrees F.) and cut the stems again an inch or so from the base. Add flower preservatives according to label instructions if maximum life is desired. Research has shown that flower preservatives can be helpful in prolonging the beauty of cut flowers. Such preservatives can be purchased from retail florists or from floral concessions in supermarkets. A mixture of 7-Up drink (not the diet type) mixed equally with water has been shown to be an effective preservative. It is important for the mixture to stand long enough for most of the air bubbles to disseminate. Equally as important as the use of preservatives is a good pure water source. Rain water, distilled or filtered water should be used when arranging flowers, since calcium, sodium and other materials in most tap water can shorten their life. Place the flowers in a cool, draft free area until ready to use. High temperatures and direct sun quickly take their toll on cut flowers. So take action now to insure that you don't miss our second spring and the beauty of the flowers which can adorn it.